GP1, Other Shape Guitar from Trivmph Guitars. A guitar with a bolt-on neck providing the same comfort and playability as a neck-through guitar: this is what Trivmph Guitars promises with the upcoming GP1 model. As in a neck-through guitar, the neck and body are joined seamlessly for a greater playability for all styles of playing. 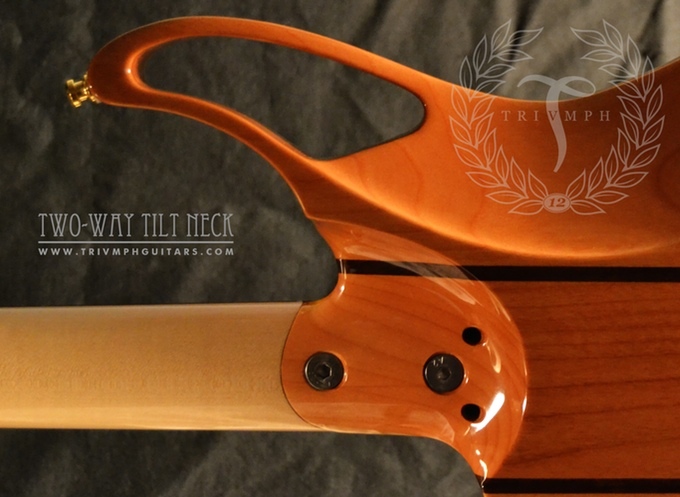 The two-way tilt neck features two low screws, an axial one that allows to tilt it to reach the lowest possible action, and a radial one that permits to set the fretboard in different positions in the treble or bass zone. The neck also features interchangeable Reso-Rod, a system close to that of a truss rod but with a more sonic-oriented aspect in the sense it is designed to affect the resonance frequency. This Reso-Rod can be replaced with another one from different materiel, size and/or form for a different effect, or even removed if the resonant effect is not needed. To finance the first series production of the GP1, Trivmph Guitars has launched a Kickstarter project with a total 29 Pre-series GP1 available, all handcrafted in Italy by Alfio d'Ambrosio. Each guitar features a 5A 8mm-thick top available in 8 colors (ulterior series-produced guitar tops will be "only" 6mm thick), exclusive front plate with laser-etched serial number, a Trivmph Parallel Twin pickup (to be chosen from either Stock 9Kohms or Race 12Kohms models, but any Seymour Duncan passive pickup can also be chosen instead at no extra charge). Each model is to be numbered and handsigned by d'Ambrosio. These limited edition pre-series guitars are available for €3,500.00 apiece and shall ship worldwide by August 2016 accompanied by a hardshell case, custom leather strap, high-quality jack and a custom set of 8 picks in a handmade wooden box. The project aims at gathering a total €15,000 before February 16th, 2016 at 10:15 CET to finance further series production of the GP1. For those who want to contribute for a lesser amount, other opportunities are available, ranging from your name written on the wall at Trivmph Guitar's showroom for €20 to different pick sets (up to €190). Trivmph's exclusive picks can also be bought as 3D files, for those owning (or with easy access to) a 3D printer. More details available at the GP1's Kickstarter project page and www.trivmphguitars.com. New Kiesel/Carvin Ultra V7 model KLiesel/Carvin Guitars has recently introduced the Ultra V7, a 7-string version of their V-shaped Ultra V guitar. Dean introduces new Dimebag model Dean Guitars has introduced new models for their 2016 collection, including another Dimebag Darrel-inspired model, the Pantera Southern Trendkill ML. Kiesel releases Jason Becker Vader JBV6 Kiesel Guitars celebrates its first anniversary with the release of the limited-edition Jason Becker Vader JBV6 headless guitar.